Races will be held on Wednesday evenings starting on May 15, 2019. Time: Wednesday Nights Race Series will have two fleet Starts. First Gun will be no earlier than 6:30PM from May thru the end of August and no earlier than 6:00 the rest of the season. Please be aware that we make these changes. The changes are announced usually the week in advance as the sunset hour changes. Signals: The courses will be announced over the radio as well as displayed on the RC Boat. Flags will be used for the starting sequence. Spinnaker Fleet will use A Fleet Flag and Non-Spinnaker Fleet will use B Fleet Flag. Race Committees MAY ALSO choose to use the VHF Radio to call the starts in conjunction with the flag signals. Race Committees for Wednesday Night Racing will use the Race Committee Boat and start the races at “S” Mark. The yellow pin which is now to be referred to as “Y” mark will be set and MAY be a mark of the course. Time Limits: The starts cannot be postponed longer than 45 minutes. The first boat to finish must finish within 1½ hours after start. Scoring: PHRF Time on Time. There are no trophies awarded. These races are fun races with fun awards given out throughout the season. All are invited to race and be scored. Boat Eligibility: ALL CYC owner boats are invited to participate on Wednesday evenings. (If you do not have a current PHRF handicap, the CYC Fleet Captain will issue you one for the Wednesday night Series.) 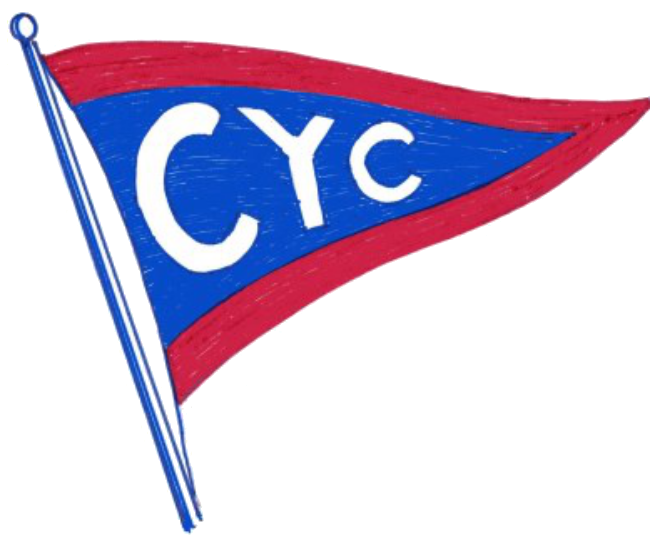 CYC has offered sailboats from the neighboring clubs and marinas the opportunity to race with us on Wednesday nights. Any boat that is NOT a CYC owned boat will either have a valid HRYRA PHRF certificate or one will be provided to them by the CYC Fleet Captain for use during the sailing season. All non CYC sailboats MUST be fully insured and submit a copy of their insurance prior to racing at CYC. Race Committee: Race committee is assigned based on last year’s competitors and their crew. Please have your crew mates serve with you. If you race and are not assigned please speak up to volunteer and be put on the substitution list. Notes: Assignments can be changed/rescheduled if needed. Responsibility rests with the chairman listed for that race. Chairman listed for each race will be responsible for getting his/her crew to assist.